If you’re looking for a natural alternative to assist in treating your arthritis or you want something to complement your conventional treatment routine, then consider Baltic amber. It has warming, soothing and therapeutic properties that make it particularly beneficial for relieving pain, inflammation and stiffness in the wrists, hands, feet and ankles. Baltic amber has special characteristics with powerful therapeutic properties that help arthritis. It is a fossilised tree resin from pine trees which formed over 40 million years ago in the Baltic Sea region. Wearing amber jewellery is a great way to benefit from its therapeutic effects. These guidelines help you to get the most from what it offers. When amber is warmed by your skin it releases small amounts of succinic acid. Succinic acid then gets absorbed by the skin and taken into the blood stream where it can deliver its anti-inflammatory and pain-relieving effects. Wearing it as often as you can is particularly important if you suffer from chronic arthritis or constant pain and stiffness. When you wear it near the painful, inflamed or stiff area, the therapeutic properties can reach the affected area faster. 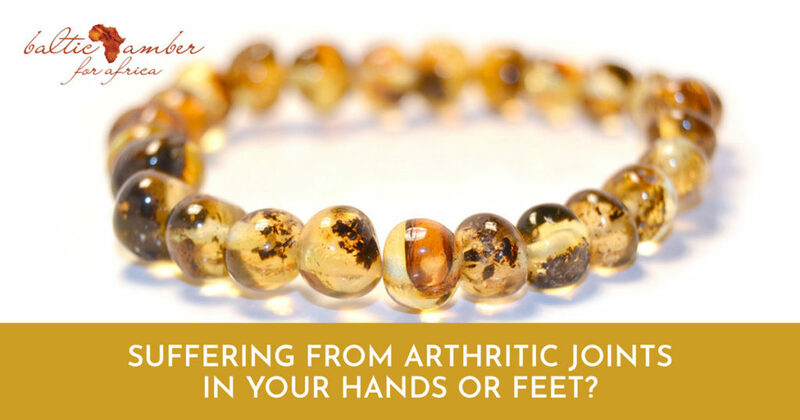 For arthritis in the hands and wrists or feet and ankles, we recommend wearing amber bracelets. Synthetic and adulterated amber does not contain the same natural therapeutic characteristics as authentic amber. Although Baltic amber is not a cure for arthritis and rheumatism, it has many natural, gentle soothing and wonderful properties to help bring relief. When you use it as part of your treatment routine, these benefits can help to ease pain and stiffness, delay the degeneration of the tissues and maintain mobility and flexibility in your joints. This entry was posted in blog and tagged Arthritis, Baltic amber, Baltic amber bracelet, Joint pain, Rheumatism.